Officials in western Canada are urging people not to release their pet goldfish into the wild because they're surviving and multiplying at an alarming rate. 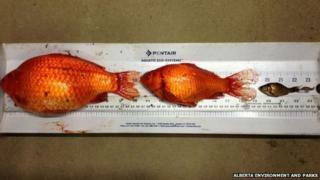 Environmental officers in the province of Alberta say they've found goldfish the size of dinner plates in the region's storm ponds. Forty of the fish were pulled from a single pond in the north of the province earlier this year, the CBC News website reports. "That's really scary because it means they're reproducing in the wild, they are getting quite large and they are surviving the winters that far north," says Kate Wilson from Alberta's environment department. CBC originally reported that officials wanted people to stop flushing the fish down the toilet, but later corrected the story to say they are focusing on fish being released directly into waterways. Goldfish are considered an invasive species in Canada, and the government is worried they could upset fragile local ecosystems. As a result, it has launched a campaign warning people of the trouble released pets can cause - even if they have already gone to the big goldfish pond in the sky. "Even if the fish are dead, they could have diseases or parasites that could be introduced, especially if the water treatment system is not top notch," Ms Wilson tells Fort McMurray Today. The campaign will also target pet stores and markets, as well as groups that engage in "mercy releases", where captive animals are set free in the belief it will create spiritual "good karma", CBC News says. Alberta has good form when it comes to banishing non-native species. For decades the region has proudly declared itself "rat-free", meaning it has no resident rat population. Occasional infestations do occur, but the government recently set up a rat hotline for residents to report any rodent sightings.